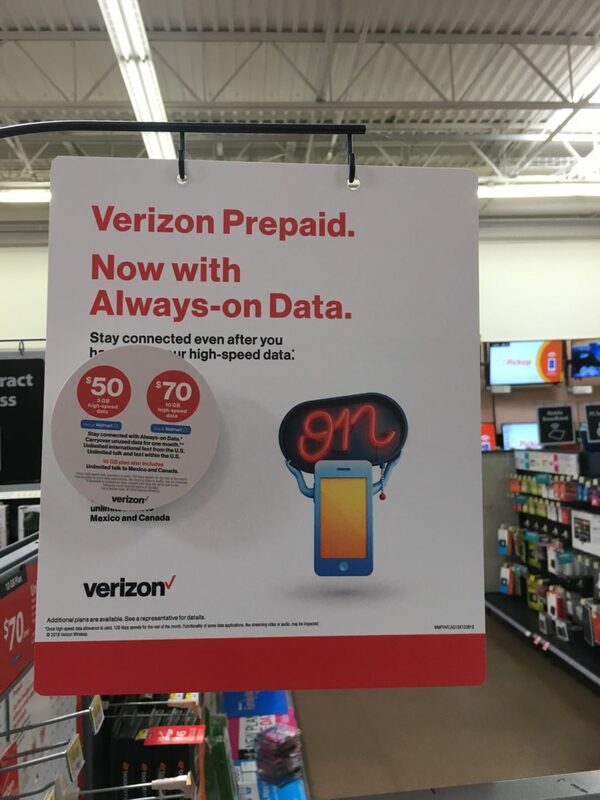 Reports are beginning to show up around the web that Verizon is offering new prepaid wireless plans sold exclusively through Walmart. There are two new plans being touted, and each plan includes unlimited talk, text and international text with varying amounts of 4G LTE data. The cheaper of the two plans is priced at $50 for 5 GB of 4G LTE data while the more expensive plan is priced at $70 for 10 GB of 4G LTE data. The $70 plan also includes unlimited talk to Mexico and Canada. Both new plans include unlimited data that gets throttled to 128 kbps once the plans allotment of high speed data is used up. Verizon calls this "Always-on data." Both plans also include data carryover, so that any unused data you have in your account at the end of a billing cycle will carryover to the next month before expiring. However, in order to get the data carryover, you must pay your bill on time. At this time it is not known if the plans will also include some sort of auto-pay discount or more data outside of data carryover for enabling auto-pay like Verizon's other prepaid plans do. Verizon's other prepaid plans include one that is priced at $45 with 2 GB of 4G LTE data that can be increased to 3 GB if you have auto-pay enabled, and another priced at $60 that has 5 GB of 4G LTE data or 6 GB with auto-pay. Both plans include unlimited talk, text and international text to Mexico and Canada. The $60 plan also includes unlimited talk to Canada and Mexico. Verizon also offers an unlimited talk and text plan with no data for $30/month. Some Verizon customers are reporting that their account no longer shows the $60 plan available as an option for them and it instead has been replaced by the two new Walmart plan options. Verizon's prepaid website still lists the $60 plan. It is possible that sometime in the future Verizon will eliminate its current prepaid plans and replace them with what is being sold at Walmart. The carrier could be using Walmart to test out the new plans before making them permanent offerings that are available everywhere. At the moment, these new plans cannot be found on Walmart's website. It could be that they are in store exclusives, or simply that they are too new and Walmart's website hasn't been updated to show them. Verizon's no contract prepaid plans operate with full speed 4G LTE data and HD Voice calling, features that Verizon's MVNO's currently can't offer. If those features aren't a necessity to you, you may find a Verizon MVNO to provide you with more bang for your buck than either of these two new offerings from Verizon. Shop Verizon Prepaid at Walmart. Thanks! They seemed to have upped the data a month or so ago. It would be interesting to know what differences there are between these Walmart Verizon plans and the current Verizon prepaids. Is the LTE data speed limited to 5Mbps down as most Verizon MVNOs are now? And what kind of roaming is available? Is the coverage map the same as Verizon prepaids? Can you voice roam for free, a fee, or not at all? Does it use VoLTE while roaming with Verizons Rural America partners? Good afternoon. The photo you attached to this article was not used with permission. Please take it down or give credit where it is due. Thank you. To whom should credit be given to? This photo is from reddit. Shame on you. No it’s not. It originally came from imgur where it’s credited to. And it can be found in the HowardForums thread the article sourced. Shame on you for not following the links!